My name isn't important. There's someone else. The man who sent me out there, the man who told me to walk the Earth. And his name is The Doctor. He has saved your lives so many times and you never even knew he was there. He never stops. He never stays. He never asks to be thanked. But I've seen him, I know him... I love him... And I know what he can do. Martha Jones is a fictional character played by Freema Agyeman in the long-running British science fiction television series Doctor Who. A traveling companion to the tenth incarnation of the Doctor, she later appeared in the spin-off series, Torchwood. I travelled across the world. From the ruins of New York, to the fusion mills of China, right across the radiation pits of Europe. And everywhere I went I saw people just like you, living as slaves! But if Martha Jones became a legend then that's wrong, because my name isn't important. There's someone else. The man who sent me out there, the man who told me to walk the Earth. And his name is The Doctor. He has saved your lives so many times and you never even knew he was there. He never stops. He never stays. He never asks to be thanked. But I've seen him, I know him... I love him... And I know what he can do. I spent a lot of time with you thinking I was second best. But you know what? I am good. You need to be careful, because you know the Doctor's wonderful and he's brilliant, but he's like fire. Stand too close and people get burned. How does it do that? It's wood! It's like a box with that room just crammed in. It's... bigger on the inside! Mr. Stoker: Now then, Mr. Smith, a very good morning to you. How are you today? Martha: [to the Doctor] That wasn't very clever, running around outside, was it? Martha: In Chancellor Street, this morning? Came up to me and took your tie off. The Doctor: [amazed] Really? What'd I do that for? Martha: I don't know. You just did. The Doctor: Not me. I was here in bed. Ask the nurses. Martha: Well, that's weird, because it looked like you. Have you got a brother? The Doctor: No, not anymore. Just me. The Doctor: I just thought, since you saved my life and I've got a brand new sonic screwdriver that needs road-testing, you might fancy a trip. 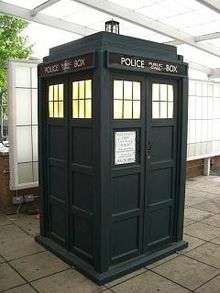 The Doctor: If it helps, I can travel in time as well. Martha: [thinking he's pulling her leg] Get out of here. Martha: Come on, now. That's going too far. The Doctor: I can prove it. [steps into the TARDIS and closes the door. Martha watches amazed as it dematerializes. He materializes earlier that morning. He walks up to Martha in Chancellor Street on her way to work, her having no idea who he is.] Like so! [removes his tie and holds it up to her] See? [He then walks off leaving an amused and befuddled Martha behind to go on to work. He then returns to that night he'd just left. As he steps out of the TARDIS, he's holding the tie he took off in front of Martha.] Told ya. Martha: No, but that was this morning! But...did you... You can travel in time! But, hold on, if you could see me this morning, why didn't you just tell me not to go into work? The Doctor: Crossing into established events is strictly forbidden. Except for cheap tricks. Martha: Oh, no, no. [turns heel and dashes back out as the Doctor waits inside, a look on his face as if he's heard this too many times before.] But...it's just a box! [Martha runs around the ship, inspecting its smaller outside dimensions.] But it's huge! [She comes back to peer at the Doctor.] How does it do that? It's wood! It's like a box with that room just crammed in. It's... [The Doctor mouths the next few words along with her] bigger on the inside! The Doctor: [sarcastically] Is it? I hadn't noticed. Martha: [after travelling to 1599] But are we safe? Can we move around and stuff? Martha: It's like in the films! You step on a butterfly, you change the future of the human race! The Doctor: [bemused] I'll tell you what, then: don't...step on any butterflies. What have butterflies ever done to you? Martha: What if...I dunno! What if I kill my grandfather?! Martha: So, magic and stuff. That's a surprise. It's a little bit Harry Potter. The Doctor: Wait 'til you read Book Seven. Ohh, I cried. Martha: This country's ruled by a woman. Shakespeare: Ah, she's royal. That's God's business. Though you are a royal beauty. Martha: Whoa, nelly! I know for a fact you've got a wife in the country. Shakespeare: But Martha...this is town. The Doctor: Good old J. K.! Martha: When you say "last time", was that you and Rose? The Doctor: [pauses, somewhat taken aback] Um, yeah. Yeah, it was, yeah. Martha: [looking put out] You're taking me to the same planets that you took her? The Doctor: [surprised, oblivious] What's wrong with that? Martha: [disappointed, upset] Nothing! [starts to stalk away] Just...ever heard of the word "rebound"? Martha: He said, "last of your kind". What does that mean? The Doctor: It really doesn't matter. Martha: You don't talk. You never say! Why not? [The whole city starts to sing "Abide With Me"] It's the city. They're singing. The Doctor: ...I lied to you, 'cause I liked it. I could pretend, just for a bit, I could imagine they were still alive... underneath that burnt orange sky. I'm not just a Time Lord, I'm the last of the Time Lords. The Face of Boe was wrong. There's no one else. Tallulah: Hey, you're lucky though. Got yourself a forward thinking guy with that hot potato in the sharp suit. Martha: Oh, he's not... We're not... together. Tallulah: [sympathetically] Oh, I should have realized. He's into musical theatre. Martha: What's wrong with old Charlie Boy over there? Martha: What, me? Don't be daft! The Doctor: I don't exactly want to get noticed. Ask them what's going on. Martha: Daleks! I demand to be told. What is this "Final Experiment"? Report! Dalek Caan: This is the dawn of a new age. Dalek Caan: We are the only four Daleks in existence. So the species must evolve. A life outside the shell. The children of Skaro must walk again! The Doctor: I'm telling you to go. Frank can take you back to Hooverville. Martha: And I'm telling you I'm not going. The Doctor: Martha, that's an order! Martha: What are you, then?! Some sort of Dalek?!! The Doctor: Black tie...Whenever I wear this, something bad always happens. Martha: That's not the outfit, that's just you. But anyway, I think it suits you. In a... James Bond kinda way. The Doctor: [surprised] James Bond? Really...? Martha: [over the intercom] Doctor? The Doctor: What is it now!? Martha: Who had the most number ones, Elvis or the Beatles? That's pre-download. The Doctor: Elvis. No! The Beatles. No! Wait, um... um... awww, that remix... um... I don't know, I am a bit busy. Martha: Fine, I'll ask someone else. The Doctor: Now where was I?... Here comes the sun... No, resources. Jenny: [referring to Smith] Head in the clouds, that one. I don't know why you're so sweet on him. Martha: Exactly! Good old London Town! Baines: Ah, now then, you two. You're not paid to have fun, are you. Put a little backbone into it. Jenny: Yes, sir. Sorry, sir. Hutchinson: [looking at Martha] You there, what's your name again? Martha: Martha, sir. Martha Jones. Jenny: Just think...In a few years time, boys like that'll be running the country. Martha: [sombrely] 1913...They might not. Joan: Who is he, Martha? Joan: It's like he's left the kettle on...Like he knows he has something to get back to, but he can't remember what. Joan: You arrived with him, didn't you? He found you employment here at the school, isn't that right? Martha: I used to work for the family. He just sort of inherited me. Joan: Well, I'd be careful. If you don't mind my saying, you seem a little familiar with him. Best remember your position. Martha: I know it sounds mad, but when the Doctor became human, he took the alien part of himself and he stored it inside the watch. It's not really a watch, it just looks like a watch. Joan: And alien means not from abroad, I take it. Martha: The man you call John Smith, he was born on another world. Joan: Then tell me. In this fairy tale, who are you? Martha: Just a friend. I'm not. I mean, you haven't got a rival, as much as I might. Just his friend. Joan: And human, I take it? Martha: Human. Don't worry. And more than that, I just don't follow him around. I'm training to be a doctor. Not an alien doctor, a proper doctor. A doctor of medicine. Joan: Well that certainly is nonsense. Women might train to be doctors, but hardly a skivvy and hardly one of your colour. Martha: Oh, do you think? Bones of the hand. Carpal bones, proximal row. Scaphoid, lunate, triquetal, pisiform. Distal row. Trapezium, trapezoid, capitate, hamate. Then the metacarpal bones extending in three distinct phalanges. Proximal, middle, distal. Joan: You read that in a book. Martha: Yes, to pass my exams! Martha: All you have to do is open it and he's back. Martha: I didn't know how to stop you! He gave me a list of things to watch out for, but that wasn't included. John: Falling in love, that didn't even occur to him? John: [despairingly] Then what sort of a man is that? And now you expect me to die?! The Doctor: Fascinating race, the Weeping Angels. The only psychopaths in the universe to kill you nicely. No mess, no fuss. They just zap you into the past and let you live to death. The rest of your life is used up and blown away in the blink of an eye. You die in the past, and in the present they consume the energy of all the days you might have had, all your stolen moments. They're creatures of the abstract. They live off potential energy. Billy: What in God's name are you talking about? Martha: Trust me, just nod when he stops for breath. The Doctor: Here we are! Cardiff! Martha: [incredulous] Cardiff? We can go anywhere, and you brought me to Cardiff? The Doctor: Ah, but the thing about Cardiff is it's built on a Rift in time and space. It's like Californa and the San Andreas Fault. The Rift bleeds energy. Every now and then, I need to open up the engines, soak up the energy and use it as fuel. Martha: So, it's a pit stop? The Doctor: Exactly. Should only take twenty minutes - The Rift's been active. Martha: Wait a minute... They had an earthquake in Cardiff a couple of years ago - was that you? Martha: [comes back] Here we go! Get out of the way. [pushes past the Doctor and kneels near Jack] Not very 100 trillion, that coat's more like World War II. The Doctor: I think he came with us. Martha: How do you mean? From Earth? Martha: [surprised] What? Do you know him? The Doctor: Friend of mine. Used to travel in the old days. Martha: [confused by his nonchalance] But he's... I'm sorry, there no heartbeat. There's nothing. He's dead. [Jack comes back to life, causing her to scream, then grab ahold of him] It's alright. Breath deep, I've got you. Jack: [grinning] Captain Jack Harkness... and who are you? Jack: I was only saying 'hello'! Martha: [flattered] I don't mind. The Doctor: [spinning around, irritated] You two, we're at the end of the universe. Okay?! Right at the edge of knowledge itself! And you're busy... [struggling to find the right word] blogging!! Martha: [shocked] Oh. My. God! [pulls out the Doctor's hand from Jack's bag] You've got a hand?! A hand in a jar?! A hand - in a jar - in your bag?! The Doctor: But that- That- That's my hand! Jack: [shrugs] I said I had a Doctor-Detector. Chantho: Chan, is this a tradition amongst your people, tho? Martha: Not on my street! [to the Doctor] What do mean, that's your hand? You've got both your hands - I can see them! Martha: [disbelievingly] What, and you grew another hand? Martha: Doctor, it's the Professor. He's got this watch, this fob watch that's the same as yours. Same writing, same everything. The Doctor: [looking terrified] Don't be ridiculous. Martha: I asked him, he said he's had it his whole life. Jack: So, he's got the same watch. Martha: But it's not a watch, it's a thing, a chameleon thing. Martha: And it's the same watch! The Doctor: [desperately] It can't be! Jack: So Doctor, tell us. Who is he? How come the ancient race of Time Lords created a psychopath? Martha: Yeah, and what is he to you? Like a colleague or...? Martha: I thought you were going to say he was your secret brother or something. The Doctor: You've been watching too much TV. The Master: What's so funny? Martha: [incredulous] A gun? A gun in four parts. A gun in four parts scattered across the world. And you actually believed that? The Master: What do you mean? The Doctor: As if I would ask her to kill. The Master: [nonchalant] It doesn't matter. I've got all of you exactly where I want you. Martha: Except that I knew it would happen. The resistance knew about Professor Dougherty's son, and I used that to get me here, where I needed to be, when I needed to be. The Master: None of this matters! You're still going to die! Martha: Don't you want to know what I was really doing when I was walking the Earth? The Master: [rolls his eyes] Go on then, tell me. Martha: I told a story. That's it. No guns, no bombs, just words. I told them about the Doctor. I told them my story, and I told them to pass it on, to tell everyone they could so that the whole world knew. The Master: [mockingly] So faith and hope...That's your plan? The Master: Nothing will happen! Prayer, is that your weapon? Martha: -Right across the world! One word, just one thought, at one moment...But with fifteen satellites! Martha: A telepathic field, binding the whole human race together. All of them, every single person on Earth, thinking the same thing at the same time! And that word, is "Doctor"! The Doctor: Martha Jones, you saved the world. Martha: Yes, I did. I spent a lot of time with you, thinking I was second best. But you know what? I am good! Donna: Do you think I should call my mum, about the ATMOS in our cars? Martha: Better safe than sorry. Donna: I'll give her a call. Martha: Donna...do they know where you are? I mean, your family, that you're travelling with the Doctor? Donna: Not really, although my granddad sort of waved us off. I didn't have time to explain. Martha: [shocked] You just left him behind? Martha: I didn't tell my family. I kept it all so secret, and it almost destroyed them. Martha: They ended up imprisoned. They were tortured, my mum, my dad, my sister. It wasn't the Doctor's fault, but you need to be careful, because you know the Doctor's wonderful and he's brilliant, but he's like fire. [pause] Stand too close, and people get burned. Martha's Clone: [having trouble speaking] My heart... is getting slower. Martha: [apologetic] There's nothing I can do. Martha's Clone: In your mind you've got so many plans. There's so much that you want to do. Martha's Clone: [finishing the quote] —"'Cause you never know how long you've got, Martha Jones... all that life..."
The Doctor: I don't know where we're going, but my old hand's very excited about it! Donna: I thought that was some bloody alien thing! You're telling me it's yours?! Martha: It got cut off. He grew a new one! Donna: You are completely impossible! The Doctor: Not impossible. Just a bit unlikely. Jack: I... met a soldier in a bar. Long story. Martha: This is Martha Jones representing the Unified Intelligence Taskforce on behalf of the human race. This message is for the Dalek Crucible, can you hear me? I repeat, can you hear me? The Doctor: Put me through! Davros: And so it begins as Dalek Caan foretold. Martha: Doctor! I'm sorry. I had to. Davros: But the Doctor is powerless, my prisoner. State your intent. Martha: I've got the Osterhagen Key. [holds it up] Leave this planet and its people alone, or I'll use it. The Doctor: Osterhagen-what? What's an Osterhagen Key? Martha: There's a chain of twenty-five nuclear warheads, placed in strategic points beneath the Earth's crust. If I use the key, they detonate and the Earth gets ripped apart. The Doctor: [shocked] What? Who invented that? Well, someone called Osterhagen, I suppose...Martha, are you insane?! Martha: The Osterhagen Key is to be used if the suffering of the human race is so great, so without hope, that this becomes the final option. The Doctor: That's never an option! Martha: Don't argue with me, Doctor! 'Cause it's more than that. Now, I reckon that the Daleks need these twenty-seven planets for something...What happens if it becomes twenty-six? Martha: [notices Rose] Who's that? Rose: Oh, my name's Rose. Rose Tyler. Martha: [softly] Oh my god...he found you! Mickey: I told you to stay behind! Martha: Well, you looked like you needed help! Besides, you're the one who persuaded me to go freelance! Mickey: Yeah, but we're being fired at by a Sontaran! A dumpling with a gun! And this is no place for a married woman! Martha: Well then, you shouldn't have married me! Martha: Jack's right. These attacks are not random. They're clinical, professional. More like assassinations. Gwen: Except Barry Leonard was a student. Who'd assassinate a student? Gwen: Yeah, I think you just cracked it. Ianto: Did he? Well, red is my colour. Martha: There is no sign of any muscle decay. You're in great shape, as ever. Owen: No use coming onto me, Jones. I'm a changed man. Martha: And no stiffening anywhere? Martha: Just answer the question. Suddenly, in an underground mortuary on a wet night in Cardiff, I hear the song of a nightingale! That Martha must've done you good. This page was last edited on 27 February 2019, at 18:16.